In the 1960s, Hawaii underwent a major growth spurt. After officially becoming a state on August 21, 1959, a romanticized idea of Hawaii spread like wildfire, complete with tiki torches, bright aloha shirts and beautiful, tanned hula dancers swaying to lazy slack-key melodies. After all, who wouldn't want to visit "the nation's newest and most exotic state." The tourist mecca was born and the following decade saw unprecedented growth and change. Prior to 1960, the pineapple and sugar industries were the top revenue producers in the islands, but between 1960 and 1970, the increase in visitors was massive. Tourist arrivals grew from 296,000 per year to 1.7 million. Writing about the construction boom in 1960, a Chicago Tribune Travel Editor said, "Hotels are rising on every hand. Apartment buildings are springing up like mushrooms. Stores and offices fill land that not so long ago was garden." Though 93 percent of Hawaii residents voted in favor of statehood, the island chain has a tumultuous history with the U.S. (its still considered a hot-button topic today). Nevertheless, statehood brought national attention to the islands, creating a worldwide explosion of all things Hawaii. Joan Blackman and Elvis Presley on the set of "Blue Hawaii"
There's no denying that Elvis Presley was one of the brightest stars of mid-century America -- and he really loved the Hawaiian islands. Elvis biographer Jerry Hopkins once said "Everyone who knew him says there were only two places Elvis felt at home, and they were Memphis and Hawaii." 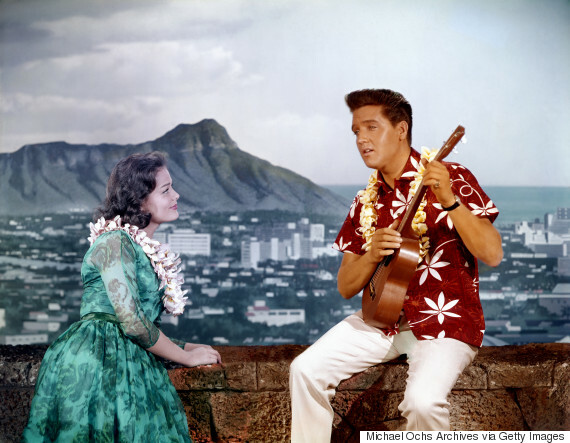 The King filmed three movies in Hawaii, all during the 60's -- "Blue Hawaii", "Girls! Girls! Girls! ", and "Paradise, Hawaiian Style." Hawaii was further drawn into the spotlight with the 1968 premiere of the hugely popular television series "Hawaii 5-0," which helped cement the young state as an aspirational vacation destination for the rest of the country. 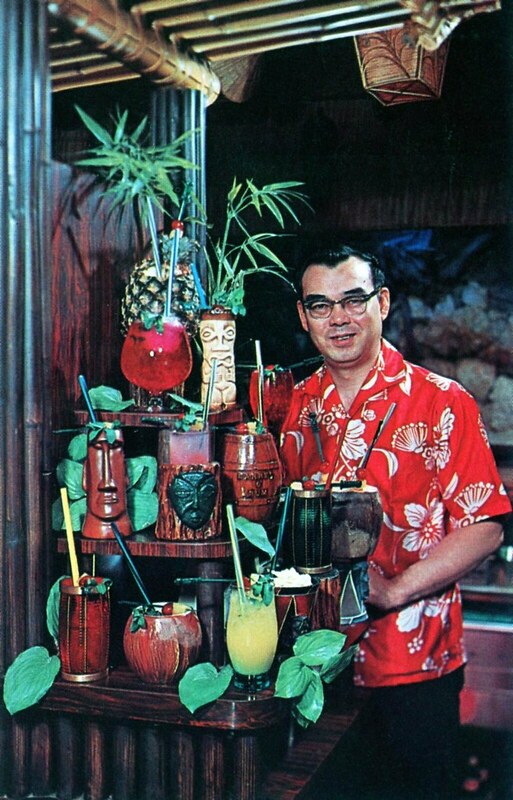 Thanks to the media's glossy representation of Hawaii, tiki culture raged through the country in the 1960s. Aloha shirts became ubiquitous -- even President Nixon got in on the style -- and Polynesian-themed hotels, restaurants and cocktails popped up everywhere. The popularity of the Kahiki Supper Club, in Columbus, Ohio, for instance, is a prime example of how the island lifestyle became emblematic of a happy, more relaxed attitude. Founded in 1961, the Kahiki checked every stereotype off the list: thatched roofs, totems, seashell lamps, skull-shaped mugs and flaming drinks. Writing in the Atlantic in 2001, Wayne Curtis said the Kahiki (which is now closed) dates from a special moment in American history, "a time when America inhabited a sort of South Seas Camelot." It's no coincidence that Hawaii -- the most isolated landmass in the world -- experienced a boom in tourism at the same time that jet travel became accessible. Pan Am's 1959 introduction of Boeing 707 jet service to the islands opened the flood gates and soon more people were traveling to the islands more often. Airlines promptly set about wooing passengers, encouraging them to travel to places like Hawaii. One vintage United Airlines advertisement describes Hawaii as "painted in every hue of the rainbow, flavored to every taste, guaranteed to relax. All you need to do is choose your island," it declares. "The aloha spirit will do the rest." 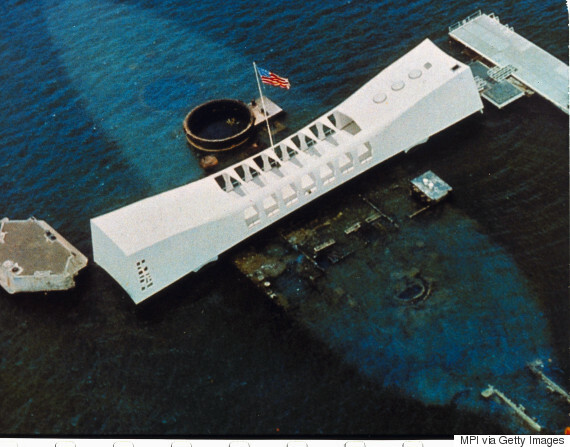 Twenty-one years after the attacks on Pearl Harbor, Americans were eager to commemorate the 2,500 men and women who died during the attacks. The iconic Arizona Memorial was constructed (thanks in part to a large monetary contribution by Elvis Presley) and finally opened to the public in 1962. In 1963, President John F. Kennedy visited the still young state and the newly opened memorial to pay his respects. Every president since has laid a wreath and dropped a flower in the memorial well, and the memorial has become a major attraction for tourists visiting Hawaii ever since. Today, more than 1.5 million people visit the memorial each year. "Let's go surfing now, everybody's learning how." The 1962 Beach Boys anthem Surfin' Safari might have only been two minutes long, but it sure did make an impact on the world's perception of surfing. Surf culture took off in the 1960s, especially in Southern California, bringing with it the advent of bikinis, boardshorts and skateboards. Tourists traveled to Waikiki Beach in droves to try their hand at the obscure sport, and the 1966 cult classic surf documentary "The Endless Summer" featured Hawaii's famous surf spots, bringing further attention to the islands' burgeoning surf industry.